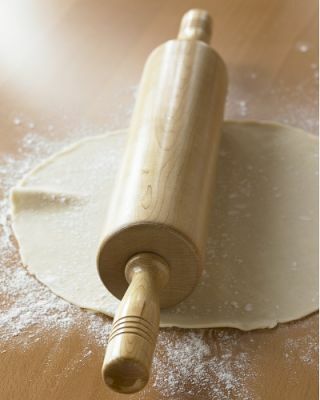 For November's Tasty Tools, we're highlighting rolling pins! With the holidays around the corner, perhaps you'll be making a pie, some festive cookies or a recipe calling for the use of a rolling pin. There might even be some folks out there that use their rolling pins in other creative ways for recipes. Regardless of what you make using your rolling pin, submit it to this month's Tasty Tools blogging event along with a picture of your tasty tool! 1) Make a recipe using a rolling pin and create a blog post about it from now (the date of this post) until midnight, November 30, 2009. Any previous blog posts you have where you've created a dish using a rolling pin (with pictures) are happily accepted. You can participate even if you don't have a blog. Non-bloggers can email the above information (sans blog details) and I'll include it in the round up. You may want to change the instructions to have November Tasty Tools instead of October Tasty Tools for the subject line. I have one that I will be posting soon (just have to get some pictures for it). Looking forward to seeing what others post as well.